BIRMINGHAM’S Kal Yafai has successfully defended his WBA super-flyweight title against Suguru Maranaka, winning by unanimous decision. In a terrific contest, Yafai was forced to prove his championship credentials against an opponent that pushed him all the way. It was a difficult evening for the champion, who forced his opponent down to his knees in the second round with a good combination of punches, but he took it on the cards 118-108 119-107 119-107. Yafai started well and looked sharp early on, finding the target to both the head and the body with ease. It was such a combination that dropped the challenger in the second. To Maranaka’s credit he recovered well but it was a 10-8 round for Yafai. The Englishman was winning most rounds, battering his opponent to the body constantly, but Muranaka never stopped pushing forward. In round seven it looked like Yafai’s bombardment was beginning to wear the challenger down, his legs looked heavy, but every time he answered with an attack of his own. 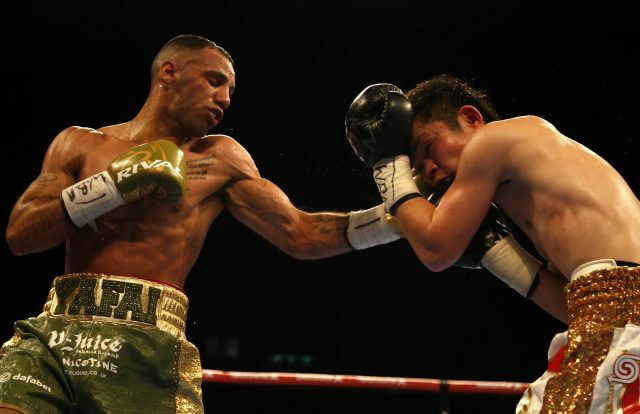 Yafai definitely hurt Maranaka in the eighth round with two left hands but he was then docked a point for low blows. He might have been disappointed he did not get the stoppage but Yafai would have respected Muranaka’s durability.